Unlike York and U of T, Ryerson’s library and Student Learning Centre (SLC) will not be open 24 hours during exam season. The library staff previously asked for an increase in funding to cover staffing costs when it extended hours to 1 a.m. This was in response to students requesting later closing hours to study. SLC building officer Susan Machado says the closing time is 1 a.m. because students often leave at that time to catch the last subway. Before the SLC opened, a survey was circulated that asked students whether the SLC and library should have the same hours. The survey received over 1,400 responses and showed that 64 per cent of students thought both should operate during the same hours. However, the survey did not ask about extending hours during exam time. Machado says since the SLC opened last year it’s remained an extension of the library. At 12:30 a.m. announcements in the SLC remind students the building is closing. At 1 a.m., security sweeps the building and dismisses stragglers. Machado said that daily headcounts show that there is an average of 50 students in the building after midnight. However students are reminded they can keep studying at the Podium building (POD), which is accessible by One Card 24 hours a day during exam time. Second year political science student Tasnia Nabila says she would like to stay much longer if the SLC remained open all night. She comes in the mornings when the SLC opens, when her friends have a study room booked at the 7th floor, rather than stay at the POD. U of T librarian Jesse Carliner said around 750 people visit Robart’s Library after midnight on busy weeks. After-hours staff in the building includes one supervisor and three security guards. Machado says the SLC is “energetic” and “nonstop” during the December 6 to 17 exam period, especially during typical peak hours in afternoons and early evenings, when staff count around 1,200 students. 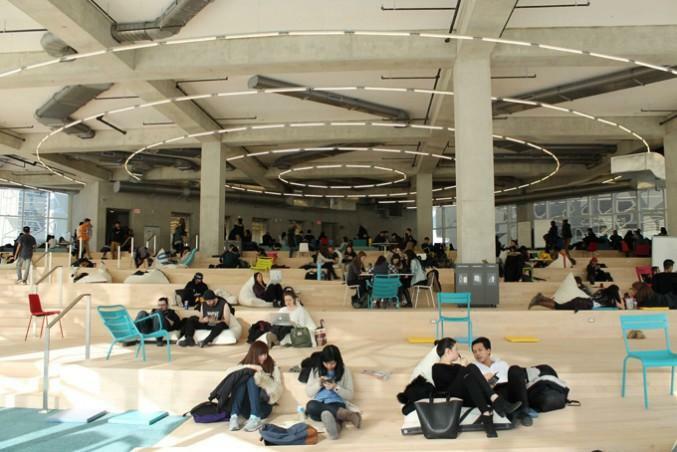 During this time, Machado said the SLC plans to accommodate more students by creating a space in the amphitheatre area in the foyer and offering tables and chairs as extra study space for students. Abdullah Bahri and Mohammad Balkan, two second year students in electrical engineering and biomedical engineering, respectively, say they study in the SLC almost everyday. Balkan prefers studying in the SLC because he gets easily distracted when he’s at home. “It’s encouraging because when you’re in the SLC, you see so many students around you. They’re studying, and you don’t feel lonely,” said Balkan.